Three adjacent waterfront neighborhoods with historic architecture, great food, and art, make an intriguing walk, or an add-on to other tours. DUMBO (Down Under the Manhattan Bridge Overpass) is a not-so-accurate acronym for a small but more sprawling neighborhood that nudges toward the Brooklyn Bridge and offers time-capsule industrial architecture (most of it renovated to a shine), a new park, and much street art. Long moribund as manufacturing declined, DUMBO revived largely because of the foresight and wiles of developer David Walentas of Two Trees Management, which I'll discuss on the tour. Renovated buildings now house residential, retail, and office tenants. 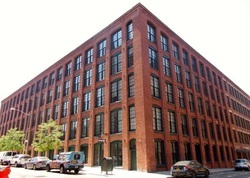 DUMBO has emerged as the home of many tech- and digital-oriented firms and has attracted enormous amounts of new investment. Even as the Brooklyn Flea arrives (on Sundays April-November), our walk will show corners that have not yet been buffed. Fulton Ferry, sandwiched between DUMBO and Brooklyn Heights, also offers great views in Brooklyn Bridge Park, plus a range of historic buildings, and some terrific places to snack and eat. It's also the gateway to the NYC Ferry on the East River. Vinegar Hill, to the east of DUMBO toward the Brooklyn Navy Yard, is a marvel: quiet, almost desolate in places, but with a working factory, a looming power plant, an isolated Buddhist temple, and an even more isolated early 19th-century mansion. Nearby, and troublingly, one of Brooklyn's poorest communities is concentrated in a housing project. Before/after tour: Food options include the Brooklyn Ice Cream Factory, Grimaldi's Pizza and Juliana's Pizza, and Jacques Torres Chocolate. Shake Shack. Walk the Brooklyn Bridge. NYC Ferry. The Brooklyn Flea is in DUMBO April-November.